First product out from Axelsson design. 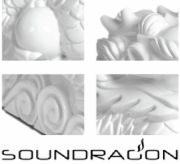 The Soundragon speakers are made for those who are looking for something more then just a good sound. The speakers are made small (31cm high) to fit in the bookshelf, by the tv, in the kitchen or may be in a shop, bar or cafè. The speakers are hand made in Sweden out of plastic resin and the elements are high end Vifa/Wavecor to give You a crisp clear sound.